Jokowi is the cognomen of Joko Widodo, Indonesia’s president since 2014. On April 17th, at the age of 57, he will be up for re-election in polls that will also see 187m voters—the third largest electorate in the world—choose between 245,000 candidates for over 20,000 national, provincial and local offices. The election commission has had to design 2,593 ballot sheets for the various combinations of contest across the country. Once these have been filled in—and 99 tonnes of ink has been used to mark voters’ fingers—ballot boxes from 810,283 polling stations will be taken off for counting by motorbikes weaving through the traffic jams of Jakarta; by speedboats on the winding rivers of Kalimantan; by wooden water-taxis in the Riau Islands; by planes in the highlands of Papua; and by horses in the poorer parts of East Nusa Tenggara. Jokowi’s rival for the top job is Prabowo Subianto, a retired general and fiery populist ten years his senior. In this sense, the election is a re-run of the presidential race of 2014, when the two men competed to succeed Susilo Bambang Yudhoyono, another former general and the first president to be elected by a direct vote after 40 years of authoritarian rule by strongmen were brought to an end in 1998. Jokowi’s victory in that contest made him the country’s first leader from outside its political, religious or military elite. This time opinion polls give Jokowi a 20-percentage-point lead. But if the result looks likely to be the same as last time, the mood of many onlookers has changed. Jokowi came to power on a wave of optimism. He was seen as a breath of fresh air, a liberal-minded reformer, a pragmatic achiever and a paragon of secularism. In Indonesia, where about 88% of the population is Muslim, religion and politics have made violent bedfellows; the separatist struggle in the province of Aceh, which came to an end in 2005, was underpinned by religious divisions. A Muslim who did not campaign as one, like Jokowi, seemed a welcome harbinger of change. As the housewives of Kampung Baru attest, Jokowi has done quite a lot of what he promised last time round. In the capable hands of Sri Mulyani Indrawati, the finance minister, the economy has remained strong. It has not grown at the 7% Jokowi promised five years ago, but steady 5% growth was enough to see Indonesia’s GDP surpass $1 trillion in 2017. The economy is now bigger, on a purchasing-power-parity basis, than that of Brazil or Britain; GDP per head is twice that of India. But as Jokowi has tried to ensure re-election over the past two years the qualities that seemed impressive five years ago look tarnished. He is increasingly close to the army, happy to make common cause with hardline clerics and willing to suppress some of the opposition. Such tendencies are nothing new to Indonesia. Sukarno, the country’s first president, having overseen an unstable parliamentary democracy in the 1950s, relied on the army to back a regime of “guided democracy” from 1957 onwards. In 1965 the army used a failed coup, blamed on the Communists, to tighten its grip on power. Hundreds of thousands died in the anti-Communist purge that followed, after which Sukarno was replaced by General Suharto, a kleptocrat. Suharto was at one point estimated to be the sixth-richest man in the world. The land owned by companies linked to his family was said to cover a tenth of Indonesia. His friends did pretty well, too. Part of Jokowi’s initial appeal was that, in a country where corruption is still endemic, he looked sleaze-free. His time as mayor of Solo, a mid-sized city in Java, and then as governor of Jakarta gave him a reputation as a reforming fixer and an honest man of the people. That is still how he is seen. In those days his signature move was blusukan: dropping in impromptu on idle civil servants or on ordinary Indonesians keen to talk about their concerns. The tone of those powwows seems to have informed his choices as president. The two biggest policies of his tenure have been aimed at improving the lives of rural Indonesians, who make up half the population. The first is building much-needed infrastructure. Decades of under-investment have left roads potholed, ports clogged and traffic unbearable. Jokowi came to power with a plan to spend $323bn (32% of GDP) over seven years on 3,258km of railways, 3,650km of roads, new airports, seaports and power plants. The government only gives vague indications as to the status of these projects, but some big ones came to fruition just in time for the election. Jakarta’s mass-rapid-transit system, delayed for decades, opened in April. 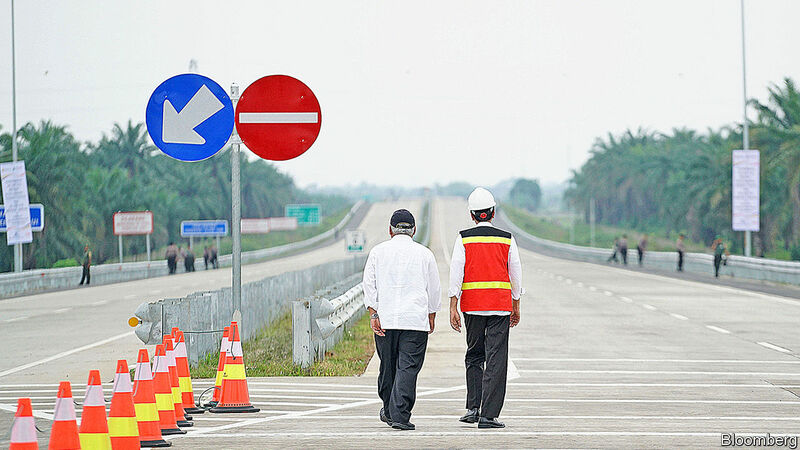 In December Jokowi opened the Trans-Java toll road, on which construction started in the 1980s. There are few things ordinary Indonesians care more about than roads. Sari, an octogenarian who runs a café close to Kampung Baru, says that new roads have helped “touch the most remote places” in the district. Farmers can get their crops to market without worrying about the food perishing. Victoria, a teacher in a rural part of Kalimantan, Indonesia’s chunk of Borneo, waxes lyrical about the highway that eases the journey from her school to the nearest town, saying it has encouraged more of her pupils to apply to university. She calls it “Jokowi’s road”. Previous attempts to meet the demand for infrastructure failed in part because landowners could and did tie up every project in lawsuits. In 2013 the government went so far as to study the feasibility of putting large parts of a Trans-Java highway on causeways off the coast to avoid such suits. Jokowi spent considerable political capital on new laws that allow the government to force landowners to sell their property for public infrastructure projects. Jokowi has also tried to boost infrastructure spending by other branches of government. He has implemented and championed a law passed under Mr Yudhoyono which sends government money directly to village leaders, bypassing district heads who are often corrupt and likely to steal it. In 2018 these payments reached $4bn (or 2% of total government spending) split across 75,000 villages. There is no reliable third-party assessment of how well this has been spent. Village heads are not immune to corruption; many lack administrative skills, some basic competence. But there do seem to be a fair few roads and bridges being built. As well as splurging on growth-boosting infrastructure, Jokowi’s administration has cut red tape. The World Bank’s ease of doing business rankings saw Indonesia rise from 120th in 2014—between Swaziland and Jordan—to 73rd in 2019—between Mongolia and Greece. But his biggest policy push has been a series of programmes designed to reduce poverty. These include better-targeted and more-generous benefits for the poor as well as enlarging school-scholarship programmes. The most popular is an expansion of basic health insurance. The number of people this covers has increased from 131m in 2014 to 205m in 2019, says Aji Budi, a public-health expert at the Jenderal Soedirman University in central Java. Out-of-pocket payments as a share of total health spending dropped from 65% to 50% over the same period. There are substantial shortcomings to the policies. In most remote places access to health care is limited and the quality of services is shoddy. Progress on many infrastructure projects has stalled. But life seems to be getting better for poor Indonesians. The poverty rate, which declined quickly between the end of the dictatorship in 1998 and 2013 but then stalled, is falling again. It dropped by four-fifths of a percentage point between 2017 and 2018, the biggest one-year fall since 2010. That pleases Jokowi: poverty reduction is the thing he truly cares about. And it helps in the polls. Jokowi’s support is strongest among rural Indonesians and those on the lowest rungs of the income scale. But despite a stable economy and many popular policies, his re-election campaign has demonstrated a trimming and cynical side of Jokowi hitherto unseen. One of the welcome policies in his first years was to cut energy subsidies; that produced some of the room for the expanded infrastructure budget. Last year some energy subsidies rose back up again; the infrastructure budget was trimmed a bit. Civil servants got a pay rise, too. That might have made sense if it had been coupled with the drastic reform that the corrupt bureaucracy needs. It wasn’t. Jokowi has also become more of an economic interventionist. In December he finalised the nationalisation of Grasberg, the world’s largest gold mine and second-largest copper mine, previously owned by Freeport-McMoRan, an American firm, and Rio Tinto, an Anglo-Australian one. “Reclaiming national resources” in this way was popular at home, but it may well make foreigners unwilling to invest in the country in years to come. A few months later he told Garuda, the state-owned airline, to cut prices by a fifth, then ordered Pertamina, a state-owned oil and gas firm, to lower the price of jet fuel. The president has been using dodgy tactics to make life harder for his critics. Last year the police blocked over 20 marches organised by 2019GantiPresiden, an opposition movement, citing incorrect permits—an objection rarely if ever raised against rallies by pro-government activists. Since January several prominent opposition figures have been arrested on flimsy charges. Thomas Power of the Australian National University notes what seems to be a tactical use of prosecutions by the attorney-general, an ally of Jokowi. In 2017 Hary Tanoesoedibjo, a media mogul who had been supporting Jokowi’s opponents, found himself faced with decade-old tax-fraud charges. Mr Tanoesoedibjo’s media assets switched their allegiance to Jokowi; the case went no further. District governors and city mayors are being similarly cajoled. Faced with an adversary who has very close links to the army, Jokowi has beefed up his own position, bringing several Suharto-era generals into his inner circle. In speeches he has encouraged soldiers to champion government policy and crack down on those who spread false information about him online. In February he toyed with reinstating a policy reserving civil-service jobs for veterans—a move the generals favour both because a lot of superannuated senior officers need jobs and because having brother officers thus installed increases their power. As yet, though, he has not gone through with it. Perhaps the biggest reversal has been Jokowi’s seemingly effortless embrace of conservative Islam. Indonesian elections often descend into piety contests. In 2014 the opposition camp harped on about Jokowi’s secular approach as a weakness, arguing that he was not devout enough and spreading rumours that he was a closet Christian. This put him on the back foot enough for him to fly off to Mecca in a show of devotion two days before the poll. But it did not seem to change his politics. This time around Jokowi is taking no chances. In August last year he chose Ma’ruf Amin as his running mate. Mr Ma’ruf is the head of Nahdlatul Ulama, a Muslim organisation that claims 50m members, and the chairman of the country’s main clerical council. He aspires to see sharia (Islamic law) enforced across Indonesia; he is in favour of banning homosexual acts and minority Muslim groups whose beliefs offend him. It is unclear what powers would be bestowed on Mr Ma’ruf if Jokowi wins; the role of vice-president is only vaguely set out in the constitution. But his appointment has added further credence to the view that Jokowi has little interest in defending minorities. This indifference was clearly displayed in 2016 when he failed to reprimand senior government officials for whipping up homophobia, restricting himself to vague calls for tolerance six months later. In the same year Basuki Tjahajha Purnama, known as Ahok, a popular governor of Jakarta who had been Jokowi’s deputy, was falsely accused of insulting the Koran. After huge protests he lost an election and was jailed for blasphemy. Jokowi said nothing. Again, he acted only later, when the government arrested some religious leaders and banned Hizbut Tahrir Indonesia, a hardline but non-violent Muslim group which had been involved in the protests. After that he sought a level of conciliation. Hence his pact with Mr Ma’ruf—who testified against Ahok at his trial. Those shocked by these events need to consider that Jokowi was misunderstood from the outset. Many, especially outside Indonesia, assumed that a politician in favour of reform and development would fight for liberal values, too. But Jokowi is a conservative man in various ways, and very risk averse. During his rise his undoubted political nous and good fortune meant that his power and popularity were rarely challenged, allowing this side of him to remain uninspected. The strains of the presidency have laid it bare. As Kevin O’Rourke, a political analyst, puts it: “He hoards political capital and doesn’t spend much of it.” He will invest it when he has to, but if he can give a bit of ground to generals or clerics to get the same electoral effect that would seem to suit him just fine. His popularity has rubbed off on his party, the Indonesian Democratic Party of Struggle. It won 19% of the popular vote in 2014 to become the biggest party in parliament, and now looks set to do even better. This is not all Jokowi’s doing, though. The coincidence of the presidential and legislative elections helps, too. Parties with presidential candidates get free media coverage and thus a boost in the polls. 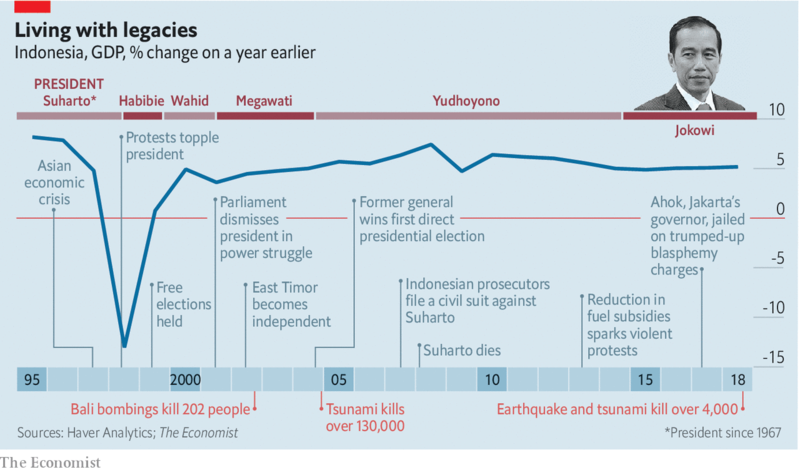 Mr Prabowo’s Great Indonesia Movement Party, or Gerindra, is enjoying a similar bump. This worries the country’s smaller parties—including those in Jokowi’s coalition dispirited by his lack of reforming zeal and authoritarian drift. The threshold for getting seats in parliament was just 2% of the popular vote in 2004; it is now 4%. With the biggest parties increasing their share, some small ones could be edged out. There is a risk of a cosy cartelisation of power in the big parties, a risk made worse by ever higher barriers to entry for new parties. Because of fears about separatism the electoral rules written in 1998 were designed to disqualify purely regional outfits; national parties had to have officers in half or more of the country’s provinces, and in half or more of the districts within those provinces. The threat of separatism has receded, but the barriers to new parties have grown yet higher. They must now have chapters in all provinces, three-quarters of districts and half of sub-districts. The gap between what was hoped for in 2014 and what Jokowi has achieved is bad news for Indonesia. If, as looks likely, he wins a second (and, owing to term limits, last) term, it will be defined by the compromises he made to do so. Back-scratching is essential to Indonesian politics, and the hardline Islamists and military generals through whom he has broadened his support will no doubt be feeling itchy. Moreover, welcome though poverty reduction is, it is not the only reform the country needs. During the latter five years of his time in power, Mr Yudhoyono sought out stability and consensus at the cost of genuine change—which was one of the reasons Jokowi won in 2014. He may now be on course to do the same. 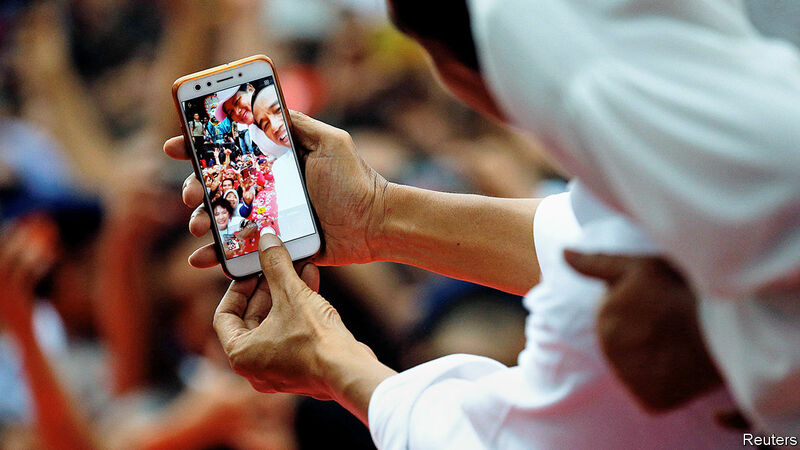 When he came to power, many saw in Jokowi Indonesia’s bright future. Now he is looking overshadowed by its past.